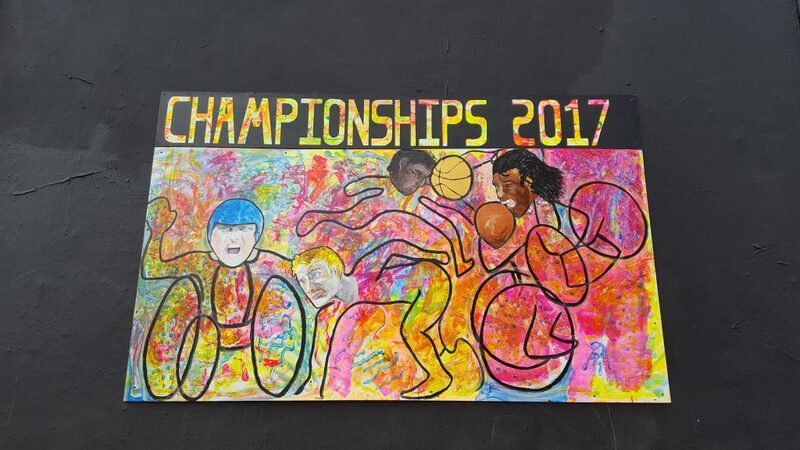 The public is being asked to suggest permanent homes for a trio of murals created to highlight disability issues. 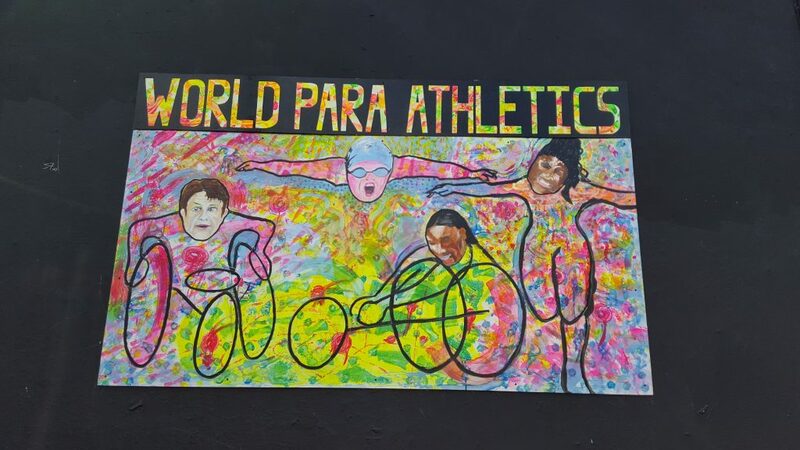 A group of disabled artists, the Vision collective, created the collaborative art boards which have been displayed for a limited time on the Shoreditch Art Wall, east London, to mark the recent World Para Athletics Championships. The collective’s mission is “to inspire artists with disabilities to have an integral voice in their community through their artwork”. 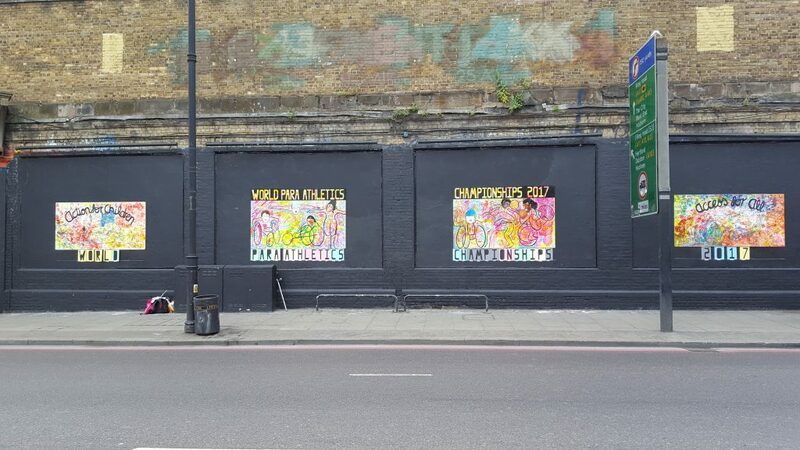 A fourth mural, created with children supported by the Action for Children charity, is earmarked for use by the charity. The Vision artists include Michelle Baharier, Dawn Barber, Dwain Bryan, Julie Cordell, David Elton, Lynda Evans, Lorraine Peacock and Sandra Pink. 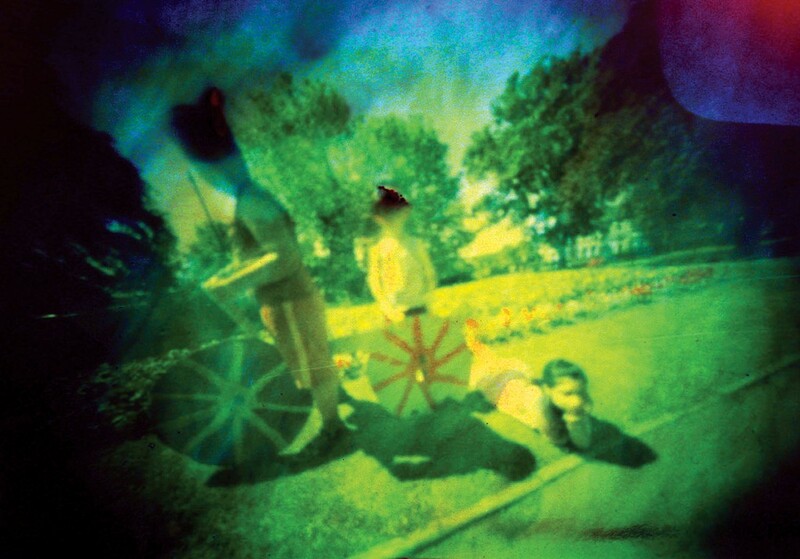 The works, created using pinhole photography, have been produced by 12 young people aged eight to 14 from Roma or new migrant backgrounds. The show is part of a Children’s Society project, the Roundabout Arts Project, and the images reflect the children’s views of their heritage and the summer of Olympic sport. 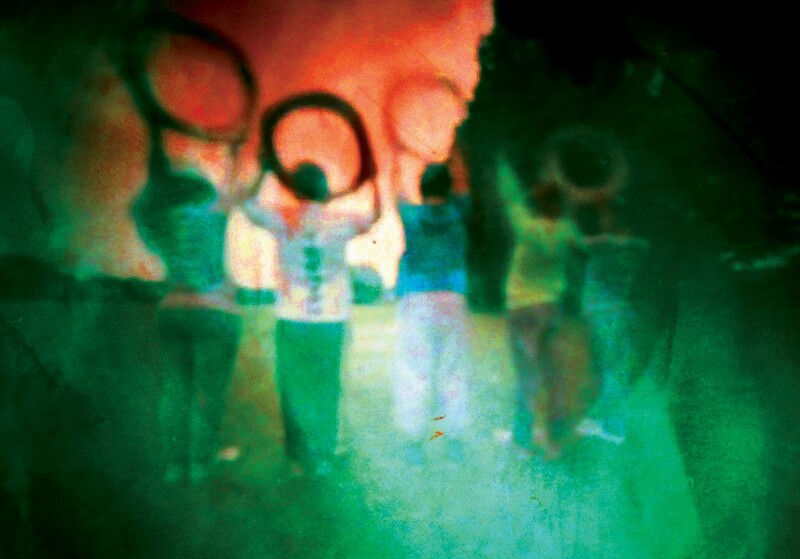 The young people from Newham created 20 pinhole photographs and an animated film (below). The project, a partnership between the Children’s Society New Londoners Roma/New Migrants Project, art group Click Academy, aims to promote a greater understanding of European migrants and Roma culture, showing the communities’ contribution to London life. * The Roundabout Arts Project exhibition is open for three weeks at The Hub, 123 Star Lane, London, E16 4PZ, 9am-8pm from Friday 19 October to Thursday 8 November. “Oh really? But she’s so good at dance” was the response of an acquaintance who misheard my explanation that my daughter Raana has fragile X syndrome – she thought I’d said “fragile legs”. Amusing though this incident from a few years ago is, it demonstrates how few people know about fragile X, the most common form of inherited learning disability estimated to affect at least 1 in 4000 males and 1 in 6000 females. It is European fragile X awareness day next week, Wednesday 10 October, and the aim is to raise the profile of the syndrome in 16 countries across Europe. I recently went to a screening of the film Mission To Lars, which features a man with the syndrome as its central subject, and I didn’t quite know what to expect. But in fact all of us who are affected by fragile X can identify with this film in so many ways. The main reason I feel it’s such an important film is that it raises awareness of fragile X in a touching and moving way. Tom’s obsession with Lars reminded me of my daughter’s obsession with the singer Noel Sullivan which began after she watched Popstars, the 2001 reality TV show that he was featured in. Even now she’ll mention him randomly in conversations, imagining what song he’ll be singing, or incorporate him in doodles, and likes to look up his latest show on the internet. On the plus side, her obsession gives her something to talk about and do (from printing off photos to flicking through show brochures) and it’s definitely sparked an interest in musical theatre and music. The flip side is that she constantly repeats herself when talking about him (“when are we going to see the show?”) and it’s totally removed from reality. The scenes in the film which show Tom hesitating to meet the drummer he hero-worships reminded me of the time when Raana went to see her own idol in a West End show but then got cold feet and refused to go backstage to meet him. I was left standing opposite him – he’d very kindly come out to say hello to her – holding a mug she’d made for him in a pottery class while Raana ran to the other end of the pavement, waving shyly. Another striking similarity was when Tom relaxes when, during the filming, he “helps” with sound recording. Raana also feels more comfortable when she has something to do, like helping with cooking when the whole family’s together. She likes to have a role rather than feel like a spare part. The relationship between the three siblings (the love and support Kate and Will give their brother Tom was very touching) reminded me of the relationship between Raana and her two older sisters. What moved me most was Tom’s bravery and how he overcame his anxiety. Routine is very important to people with fragile X and for him to leave his familiar surroundings and travel hundreds of miles on this adventure was admirable. If you see the film, it’ll give you a better understanding of fragile X and of how it affects not only the individual, but the family dynamics and siblings. For people who have a FX member of family, it makes you feel are if you’re not alone. Watching some of Tom’s reactions, I couldn’t help but think “I’ve been there”. 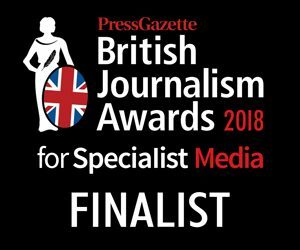 Although I saw Mission to Lars before the Paralympics, the summer’s sporting events did make me hope that more people would be more aware of disability and learning disability issues, and people’s attitudes should change for the long-term. Films like Mission to Lars will help bring about this change. There’s no shortage of media coverage of the Olympics and Paralympics, but one new online platform offers a unique and important perspective on the games. Games Through Our Eyes is an accessible website for the 2012 Paralympic Games created by young reporters with learning disabilities. The team is supported by arts group Heart n’ Soul and social enterprise communications agency Poached Creative. Games Through Our Eyes is covering wheelchair rugby, the three Paralympic sports open to people with learning disabilities (swimming, athletics and table tennis) as well as the Cultural Olympiad. This year is first time in 12 years that people with learning disabilities have been allowed to compete after Spain’s basketball team faked their disabilities in the 2000 Sydney games. 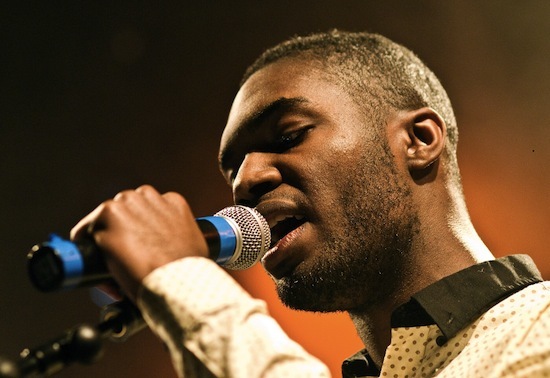 The reporting team includes Dean Rodney, a 22-year-old singer and rapper with autism whose audio-visual project, the Dean Rodney Singers, is part of the Cultural Olympiad. Dean, who has honed his performing talents through Heart n’Soul and who I’ve blogged about before, is part of the Unlimited showcase at London’s Southbank Centre starting today. 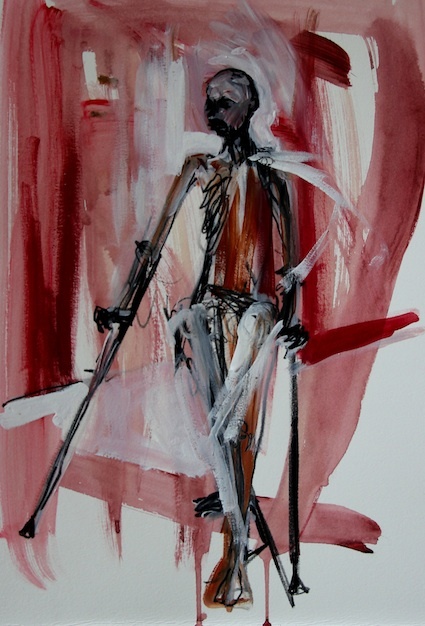 Unlimited is staging cultural events alongside the Paralympic Games, having made major new commissions in disability, arts, culture and sport (for artist Rachel Gadsen’s contribution to the Cultural Olympiad, for example, see this previous post). Alongside Lilly and Dean, the other reporters are Nicola Holley, Poppy Collie, Shalim Ali, and Laura Jarvis. Expect some good coverage of Dean’s installation; the Dean Rodney Singers is an international digital collaboration of 72 musicians and dancers with and without disabilities from countries including Japan, China, South Africa, Germany, Brazil, Croatia and the UK. Their online interaction results in new music, dance and video and 23 of their pieces will be launched at the Southbank Centre today, with audience participation promised through interactive technology (the idea is viewers and listeners engage with the performers). As well as the Dean Rodney Singers, other Heart n Soul artists perform in events during the Paralympics – the fabulous Lizzie Emeh at the Trafalgar Square Live Site this Sunday – fresh from accompanying Beverly Knight at the Paralympics opening ceremony – and The Fish Police (which Dean Rodney also fronts) at the Potters Field Live Site on Monday. The arts group’s spectacular multi-media club night The Beautiful Octopus Club (created by and for people with learning disabilities) is on Friday 7th September at Southbank Centre, the final weekend of Southbank’s Paralympic Games celebrations. Living with chronic health problems and facing social taboos are issues at the heart of an international artistic collaboration about HIV/AIDS as part of the Cultural Olympiad. which launches today as part of the London 2012 Festival. After today’s launch at the Museum of Archaeology & Anthropology in Cambridge, the exhibition culminates at the Southbank Centre during the Paralympic Games. 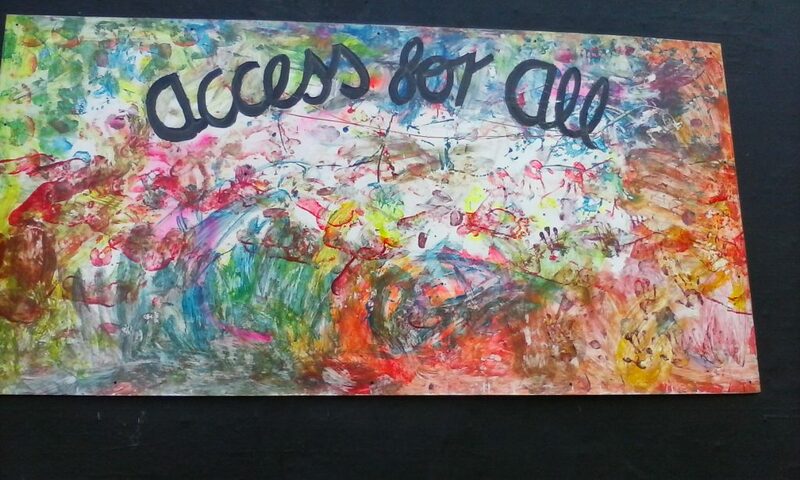 The project has been produced by Artsadmin and commissioned by the Unlimited programme launched to celebrate arts, culture and sport by deaf and disabled people. 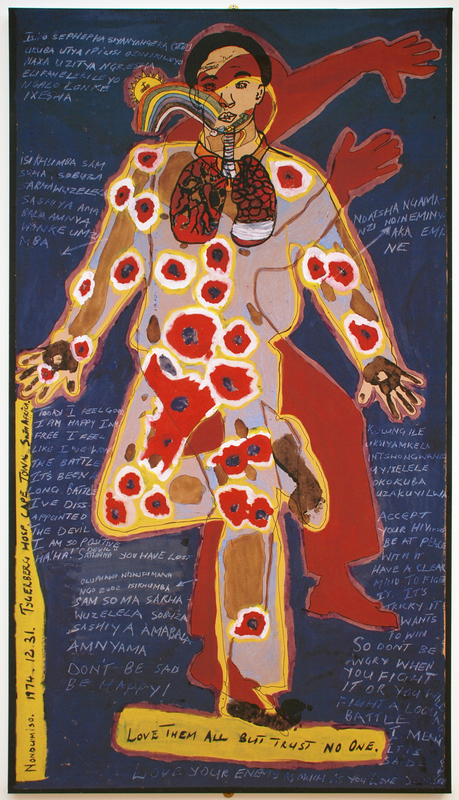 Artist Rachel Gadsden, who has lived with disability all her life and whose inspiring work I came across last year, began the project after seeing the work of South African artist Nondumiso Hlwele at the museum in Cambridge – Body Map, below, reflects Hlwele’s experience of living with HIV. 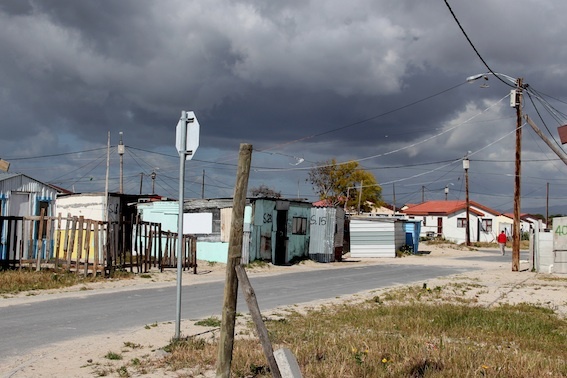 Gadsen travelled to the Khayelitsha Township, Cape Town, pictured below, to collaborate with the artist-activist collective which Hlwele leads. 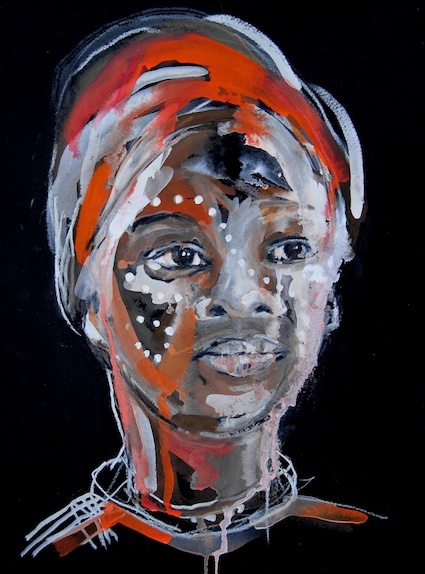 The works in today’s exhibition were created over a six week residency in Cape Town in October last year. You can follow the project on Twitter with the hashtag #UGAlchemy and the exhibition is at the Museum of Archaeology & Anthropology in Cambridge until 18 August before it transfers to the Southbank Centre, London in September as part of the Unlimited Festival. 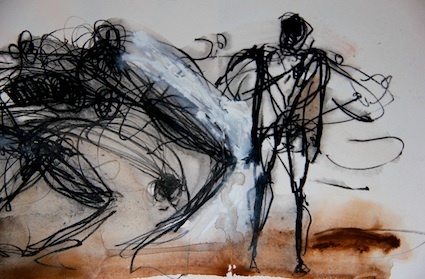 There will also be a collaborative performance work once the project transfers to the Southbank.